Chic and sleek, this Nadiya cork wedge sandal is dressed in richness from top to bottom. At your ankle, a comfortable strap, large, rounded buckle and heel cup make for an easy, stable fit. Its 5-inch wedge and 1.25-inch platform make for a smooth curve to enhance the line of your foot, further gentled by its lightly padded sole. 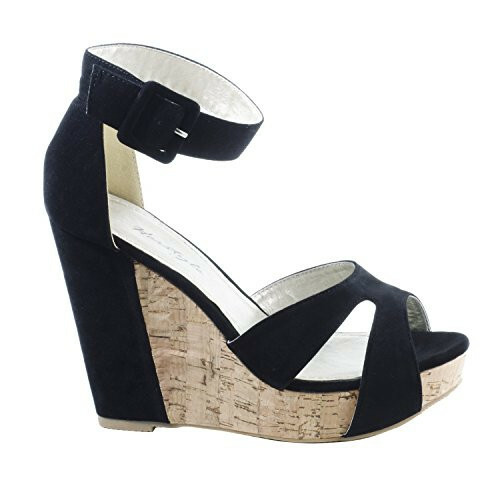 At your toes, a trendy crisscross of straps and an open-toe make for stylish comfort. With its cork wedge and unique green, tan and black colors, the Nadiya pairs well with skinnies or to add height to flowing skirts. Available in sizes 5 to 11.